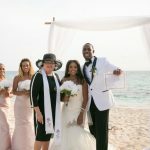 Residents of the Cayman Islands often ask me whether they can "come in and sign the paperwork" to get married, and have the wedding ceremony later. It actually doesn't work like that. 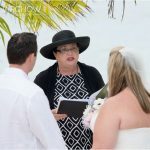 Under the Cayman Islands Marriage Law you have to have a wedding ceremony, even if its a short civil ceremony. This is because there are certain things I have to ask you and your response has to be witnessed by at least two people over the age of 18 years. Once these formalities are over then we do the legal paperwork, which I file on the next working day with the Registrar of Marriages. Many of the couples who are married at my office in a simple ceremony choose to have a "Wedding Blessing" or a wedding reception at a later date. 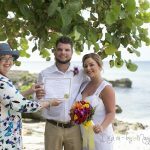 When you have a Registry Office ceremony you can still make the day as simple or as elaborate as you wish. For example, you can wear a white wedding dress or something more casual. You can carry flowers, exchange rings, or not...exactly as you wish. Most people will have either an official photographer, or at least a friend with a good camera. The only limit is to the number of people who can attend. If you have more than 10 people we will have to have the ceremony out of doors in the garden. The biggest advantage to a Registry Office wedding is that it costs less. The biggest drawback is that it has to take place during office hours which are Monday - Friday, 9am - 3pm. Our office is on North Church Street, George Town - I also provide Notarial Services by appointment. An appointment is important because I am not always in office. 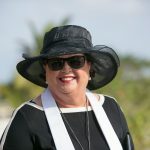 We are a full service wedding business operating in the Cayman Islands. Most of our clients are visitors, either cruise or stayover. We specialise in simple, elegant, personalised weddings.